Austin, Texas – During the SuperComputing 2015 (SC15) conference November 16-20, an International team of high energy physicists, computer scientists, and network engineers led by the California Institute of Technology (Caltech), SPRACE Sao Paulo and University of Michigan, together with teams from FIU, Vanderbilt and support from vendors including Dell, Mellanox, QLogic, SGI and Spirent are working together to demonstrate large data flow transfers across an highly intelligent SDN network. This work is being supported by SCinet Network Research Exhibition (NRE) and also presented in the INDIS workshop and submitted to IEEE ACM for the publication. 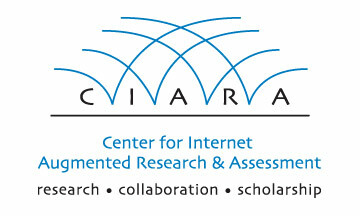 Click here to read the paper submitted to IEEE. SDN demonstration revolves around an OpenFlow ring connecting 7 different booths and two WAN connections. 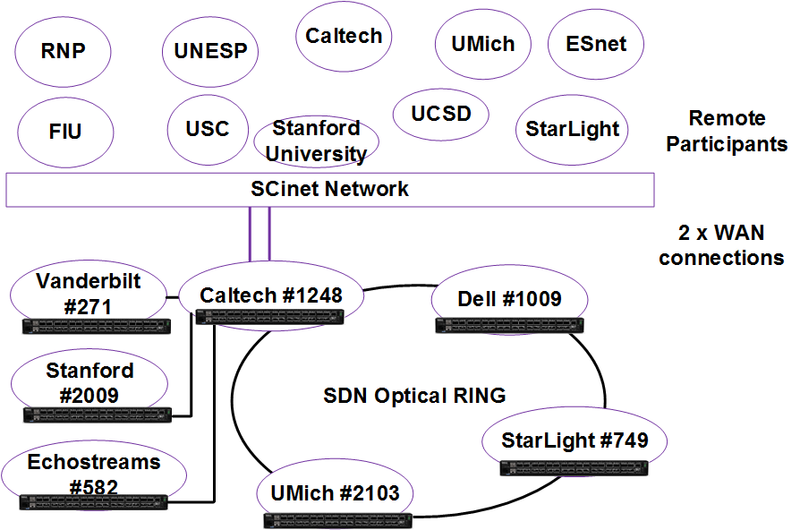 Some of the WAN connections are built using the NSI and then stitched using the custom SDN application. This helps creating an intelligent design where large flows traverse across various paths based on either the shortest or the fastest routes availability. Remote NSI paths are shown in the picture below. 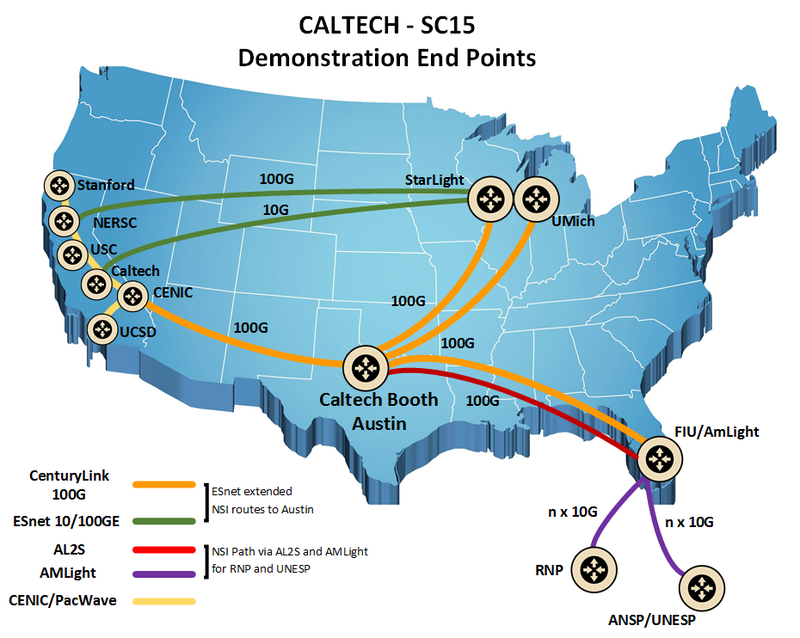 An interesting aspect is that all the remote switches will be controlled by a single ODL controller in the Caltech booth at the show floor. With the recent scientific innovations and continuous outcomes in the major fields like LHC, Genomis, Astronomy, Oceanlogy, the data volumes are increasing and requires efficient protocols and mechanisms to transport across the globe. The group will present such technologies and demonstrate data transfers at 100GE from disk to disk. A separate demonstration will show the future challenges on the systems design for the 400GE and beyond between a pair of systems. NDN project aims to develop a new Internet architecture that can capitalize on strengths — and address weaknesses — of the Internet’s current host-based, point-to-point communication architecture in order to naturally accommodate emerging patterns of communication. By naming data instead of their locations, NDN transforms data into a first-class entity. At SC15, a separate NDN node will be announcing LHC data objects while the visualization software from the NDN group will show case data flows to the shortest routes. This work is made possible by the strong support of the US Department of Energy Office of Science and the National Science Foundation. 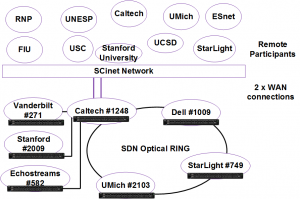 Join us for a special workshop “SDN for Scientific Networking”, a technical half-day workshop held in conjunction with SuperComputing’15, that brings together domain scientists, HPC experts, network operators and security practitioners for a discussion of the current state of Software Defined Networking (SDN). With participants from campuses, academia, research, industry, and government, this workshop will discuss current and proposed uses for SDN in scientific communities. 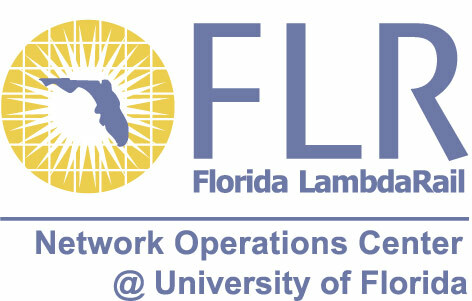 This workshop will explore the use of SDN for network optimization, address the security challenges with SDN and discuss emerging SDN architectures. The paper panels and lightning talks will focus on innovative SDN use cases either planned or in production. For the schedule of the workshop click here. Software Defined Networking (SDN) is an emerging technology with the potential to revolutionise the way networks are provisioned and managed. SDN offers solutions for improving network flexibility and reducing costs via software-based management and control. 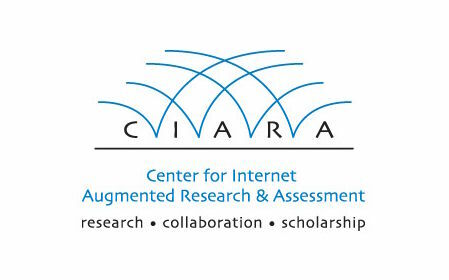 “The Testbed is a real-world research network environment, a simulation of the Internet that we’ve put in place to make it easier for researchers in the fields of computer science, engineering and mathematics to test, prototype and validate advanced networking concepts in the SDN arena and accelerate the development of high-speed networking. 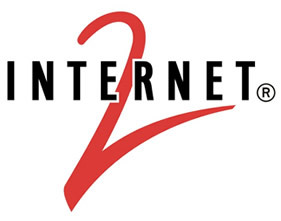 Developing and supporting initiatives to explore what the future network might look like has been a focus of AARNet’s work since its early days of pioneering the Internet in Australia,” says AARNet’s CEO Chris Hancock. David Wilde, AARNet’s Chief Technology Officer says access to a wide-area SDN testbed provides researchers with new opportunities to exploit the potential of SDN. A consortium of researchers from CSIRO Data61 and nine universities, led by the University of New South Wales (UNSW), secured LIEF (Linkage Infrastructure, Equipment and Facilities) grant funding from the Australian Research Council to deploy SDN equipment within each of their labs. The other eight consortium members are University of Technology Sydney, Macquarie University, University of Adelaide, RMIT, Swinburne, University of Queensland, University of Wollongong and Australian National University.